About Clare | Graphic Design New York | Clare Ultimo Inc.
Clare Ultimo is a New York based interdisciplinary artist, designer, writer and educator. She began an award-winning design studio in 1987, and was among the first wave of communication designers in New York to promote ecologically and socially responsible ideas to corporate clients. 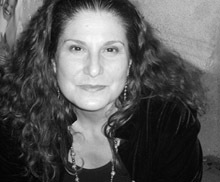 In 2000, she invented "Poetry Dog Tags" and "Friendship Tags", (poetry you can wear!) published by Chronicle Books. Ultimo has recently received an MFA in Integrated Media Arts from Hunter College and has taught Communication Design at Parsons, Pratt and Hunter. 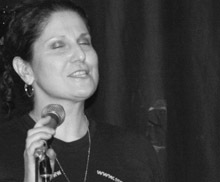 Applying design, writing, editing and video, she created "Verbs On Asphalt: The History of Nuyorican Poetry Slam" (www.verbsonasphalt.com) in 2007; the first online "museum" of New York's original Poetry Slam that spans its 20-year history. Available for lectures and/or workshops in the following areas. Academic, corporate and non-corporate environments. Email here or call for more details, schedule and availability. Looking in unlikely places for design solutions and design implementation. You'd be surprised at how little (or how much) you can do. Creative writing applied to commerce and it's interconnection to visual media. Structuring an accurate archive and resource in a cross-media world. Cross-cultural effects of wisdom teachings and ancient visual forms in an electronic world. History and influence for the growing popularity of spoken word in competition.